Our company history starts with a tour through four generations of wood craftsmenship. Starting with humble beginnings in a small wood workshop in Europe, in the late 1890’s, the first generation of wood craftsman started by providing custom window frames and shutters. By 1929, Joseph Braica inherited the business from his father, which laid a foundation for the 2nd generation of wood craftsmen. After fighting the Nazi regime in World War II, Joseph came back with the equivalent of the Purple Heart and personal recognition and letter from the King of Romania. Upon his return, Joseph saw the opportunity for rebuilding the post-war market. He started building, window frames and shutters, caskets, and wood flooring. Joseph’s supply of wood came from his sister who owned a lumber yard in a different city. With quality and reputation as a standard, Joseph started manufacturing his own precision milling machines in order to be one cut above the rest of his competitors. Having the highest quality available, the products installed in Europe are around still to this day. Quality was the predominant factor in the company which, in turn, was passed along to his three sons. Joseph passed away in 1996 but not before his youngest son, Victor, continued the legacy. After immigrating to the U.S., Victor opened a hardwood flooring contracting business in 1991 in Chicago. The business grew from 1 to 3 crews and, eventually, selling the business in 2000 when he moved to Arizona. In 2003, he opened up Quality Wood Floors and started as a contractor. He maintained that status until 2006. George Braica, Victor’s eldest son and 4th generation wood craftsman, took over operations in 2007 and changed the company to a business-to-business distributorship, which services floor covering stores in Arizona. The business change caused the name to change to Quality Distribution. At the same time, the company hunkered down to ride out the financial crisis that plagued the housing market. 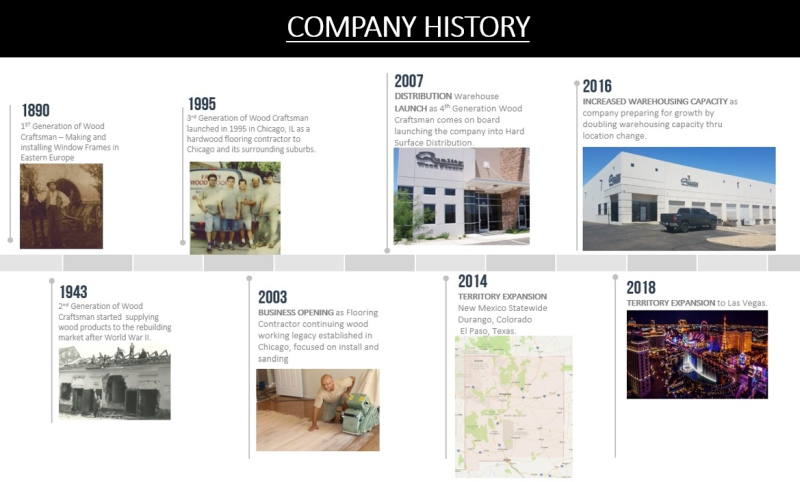 In 2011, after seeing a couple of competitors crumble during the financial crisis, Quality Distribution’s leadership was able to regain the company’s footing in the wood flooring industry. The company was poised to grow once again and recoup the losses from the difficult years. Throughout these challenging years, George continued his university education and graduated in early 2013. Years of experience, generations of handed down skills, and his business acumen provided George with the ability to establish a new strategy to put the company on the road to growth and success. Through rebuilding the workforce, strengthening supplier relationships, and creating a sales system to outmatch the competitors, Quality Distribution started recording record numbers for the company starting in January 2014. After the first quarter of significant growth, the company deployed its expansion strategy to the New Mexico market. Today, Quality Distribution is conducting research to determine the next area in which to expand. While research is important, our home branch in Arizona is looking to expand to a 10,000 square foot facility to incorporate more stock and space to serve our customers, while exhibiting the same core values, which made us who we are today. Our of way of doing business has stood the test of time, trends, and challenges, which has helped us become a strong distributor that currently delivers more than 40 in-stock colors of wood and laminate through our 100,000 square feet of stocked product. More than that, we have back-up stock of all our colors in our California warehouse. Quality is aggressively growing its market share and presence through our vast experience of four generations of wood craftsmanship, loyal and dedicated employees, fantastic and faithful customers, and our ability to meet challenges head on with confidence and persistence. We expect to continue our expansion throughout New Mexico by establishing new customers in the larger, metropolitan cities. Our goal is to establish a stocking warehouse location in the state that will service our customers. Furthermore, we plan on launching new territories using the same expansion model we used during the New Mexico expansion. Quality Distribution practices a continuous process improvement strategy, which allows us to be nimble in the marketplace. We continuously look at ways to improve our innovative sales model, build great relationships, serve our customers with the highest caliber service possible, and work together in a teamwork environment to create a community, a family, and the sense of belonging. We are part of something bigger and we want you to be part of our exciting journey. We look forward to being your solution for all of your flooring needs. Welcome to Quality Distribution!